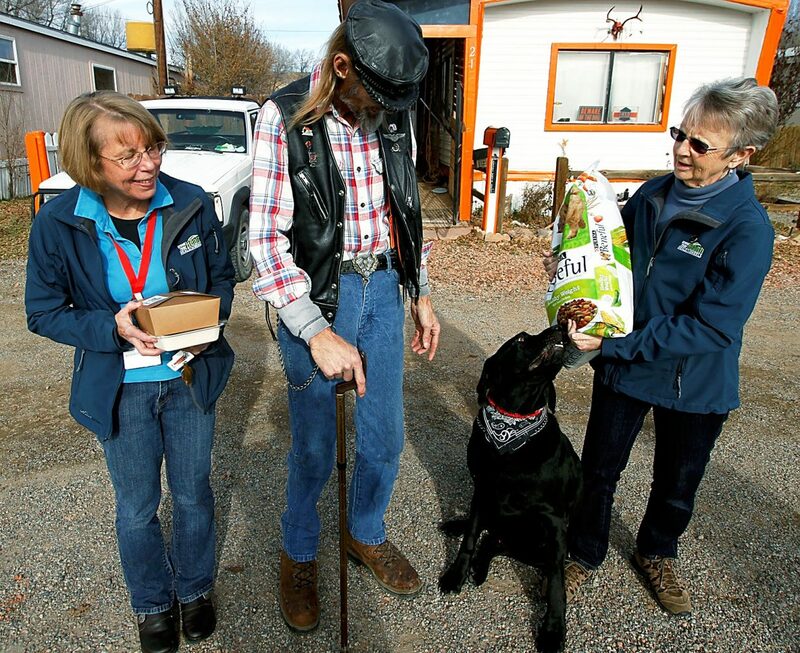 Connie Noel, left, and Donna Fogel, right, deliver food from Meals on Wheels to Chet Reiner and his black lab Sabbath in Rifle. Meals on Wheels at Grand River Health in Rifle makes meal delivery a family affair by including its participants’ companion animals with its Portions for Pets program. Meals on Wheels at Grand River Health is part of the Meals on Wheels Association of America, a national network of more than 5,000 senior nutrition programs. Volunteers with Grand River’s program deliver meals to elderly, disabled, hospice and recovering individuals in New Castle, Silt, Rifle and Parachute/Battlement Mesa. Meal deliveries also provide a bit of social interaction and a quick safety check that helps senior adults, many of whom are struggling with health and financial concerns, continue living in their own homes. Kaaren Peck, director of volunteer services for the program, started the Portions for Pets program in 2011 with a $1,500 grant from the Banfield Charitable Trust. Banfield Pet Hospital established the trust, a separate 501(c)3 nonprofit in 2004 to help individuals in need provide veterinary care for their pets. The trust has developed additional programs of its own and also provides grants to other organizations that help people and their pets stay together. Scientific research backs up anecdotal evidence that companion animals are good for senior adults’ health. Studies have shown that petting a dog or cat lowers blood pressure in hypertensive patients and that caring for a pet improves alertness and eases the effects of serious illness or the loss of a loved one. Pets make people laugh, which can help prevent depression. Aging people who have pets are more physically active and more likely to stay in their own homes. So pets are good for people, but caring for them can be a challenge with age or disability. Meals on Wheels and other groups report that people in need will do whatever it takes to keep their pets with them. For people who are struggling financially, this can mean sharing human meals or going without needed medications and other necessities to buy pet food. The situation can result in poor nutrition for both people and their pets. Grand River’s Portions for Pets celebrates the special bonds between people and their pets. By helping people care for their pets, the program helps people keep their pets, which in turn helps people stay in their own homes by improving mental and physical health. The original Banfield grant kept Portions for Pets going for about a year and a half, supplying one large bag of dog or cat food per month to its clients. But when that money ran out, Grand River Health employees committed to continuing the pet food program with $1,500 per year from its Caring and Sharing fund. Peck said most Portions for Pets clients have cats or small dogs, so the usual 20-pound bag of food lasts a long time. She added that the program provided more than 6,000 pet meals in 2013. Meals on Wheels strives to meet individual dietary needs providing regular, diabetic and cardiac meals for people and by providing regular weight loss or other requested food types for pets. Joel and Janet Davis of Parachute have been Meals on Wheels clients for several years and describe the program as a blessing. Joel Davis said he and his wife are “retired, disabled and broke,” which made it difficult to provide food for their dogs, Princess and Baby. He said the dogs, whom he lovingly describes as spoiled brats, were getting too much table food but now are happy participants in the Portions for Pets program. Grand River Meals on Wheels volunteer Donna Fogel, was instrumental in starting the pet food delivery. Peck said she would come in early on delivery days, buy the food and label it for the different Meals on Wheels routes. Grand River Health recognized Fogel as a Volunteer of the Year in 2012 because of her participation. Brittany Smith of New Castle is now the primary shopper for the pet food program, which delivers on the first Tuesday of each month. She purchases the pet food, then meets with other drivers at Grand River to label and load it. She said the volunteers look forward to the deliveries as much as the people and pets. Some of the volunteer drivers even provide their own treats for the pets on their routes.